News > Health & well-being > How are UK independent schools encouraging positive mental health? An internet at the fingertips of children that houses millions of altered images and unrealistic expections means that teachers must do their part to encourage children to be their brilliant ‘unfiltered’ selves. Anthony Seldon, vice-chancellor of the University of Buckingham, says when he introduced the idea of mindfulness to schools, people were unsure. “There was a hostile reaction at first as mindfulness wasn’t known about then. People were suspicious of it,” he comments. He ran informal sessions at Whitgift School, Tonbridge School and Brighton College, then introduced mindfulness and stillness more regularly when he became head of Wellington College in 2006. Now, he observes, mindfulness has moved from “the marginal into the mainstream”. Having practised it for 40 years, Seldon understands the benefits mindfulness can have on a child’s wellbeing. 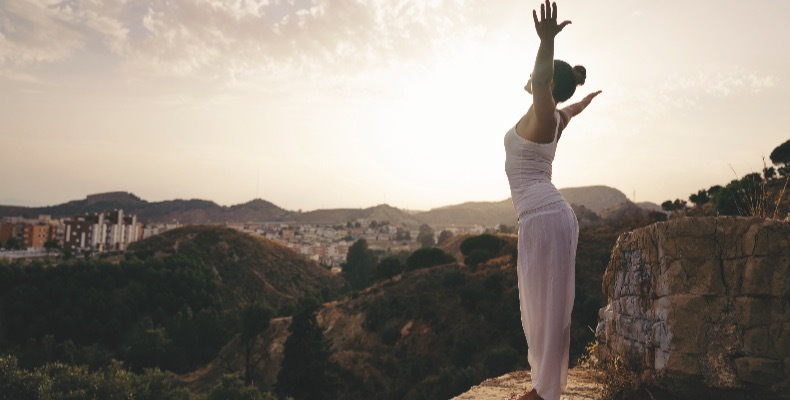 He says: “Mindfulness can help both students and staff to become more philosophical and accepting, better able to negotiate the strains and stresses of their lives with equilibrium. It has been shown to be an invaluable tool to help bolster young people’s resilience to psychological stress. 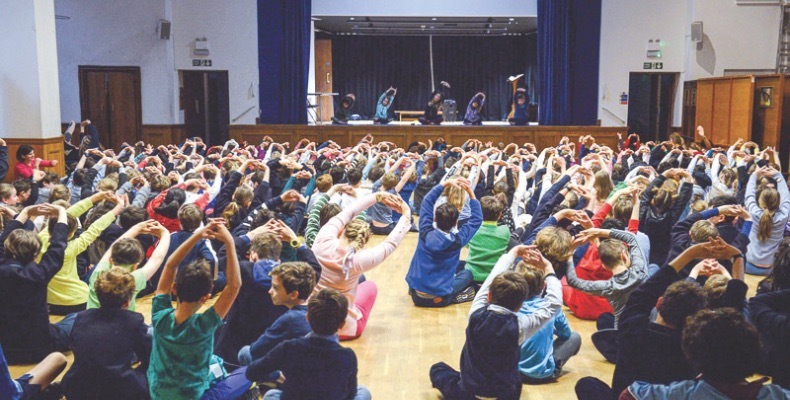 At Fulham School, many teachers both start and end lessons with a one-minute mindfulness session. Will le Fleming, headmaster of Fulham School and head of Fulham Senior, explains: “The keystone of our approach to mental health and wellbeing at Fulham School is openness. “Many issues around mental illness require sensitive treatment. We want as often as possible to address this whole area openly, fearlessly and in warm collaboration with pupils and parents. We’re finalising the publication of our mental health and wellbeing policy, to give everyone the confidence to seek support when needed. The school also works with organisations such as Digital Awareness UK, Role Models, Jigsaw and Headspace, and invites motivational speakers to talk to students. Other recent initiatives include growth mindsets, which was learnt through a poster competition for younger pupils, as well as holiday courses in resilience and leadership. Fleming continues: “Alongside all of this, we have plenty of opportunity for both support and downtime from board games in the senior school to quiet play areas. The mental wellbeing of our staff is key too. We recognise that our educators require support for their wellbeing. In addition to the head’s open-door policy, we offer access to counselling services and Headspace. When it comes to innovative mental health practices, Loughborough Amherst School, is certainly shaking things up. The independent day school for girls and boys abolished traditional reports last year, believing they offer little value. The school embeds good mental health practices through its Minerva programme, named after the Roman goddess of wisdom. It prefers this than discussing mental health on an ad hoc basis in assemblies, for example. The school holds an annual Minerva Day to explore communication skills, spirituality, resilience and using technology in a healthy way. Murphy also spoke about the unhelpful nature of ‘inspirational’ messages. He says: “I firmly believe – perhaps controversially in our ‘you can do anything’ culture – that we are doing our young people a disservice if we don’t equip them with the skills to fail as well as succeed. By concentrating purely on academic and not emotional intelligence, we risk sending them out into the world lacking the resilience and self-knowledge to navigate societal pressures and leaving them more vulnerable to mental health problems. “Let’s put this in context. Social media is often blamed for having a damaging effect on teenagers’ minds and while far from the only pressure they face, continually being bombarded with filtered and unrealistic images won’t help anyone feel good about themselves. The same is true of supposedly ‘inspirational’ messages, which are usually little more than meaningless lazy clichés that simply create a chasm between rhetoric and reality. At St Swithun’s School in Winchester, an education programme has been rolled out to tackle the subject. School counsellor Dr Helen O’Connor says: “At St Swithun’s we see wellbeing as central to the role that we play alongside academic subjects and the academic enrichment. We acknowledge that without a healthy mind the girls cannot achieve their full potential. “It’s with this in mind that we have embarked on a positive education programme adapted from Geelong Grammar School in Australia which seeks to introduce a whole school pastoral programme in which everyone practises strategies for promoting positive emotions and resilience. “We believe that a positive education model which teaches girls that positive emotions, relationships, health, accomplishment and purpose are central to developing healthy ways of managing. By learning this in an academic environment it helps rescue their vulnerability to developing more severe mental health problems. What else are schools doing to encourage good mental health? King’s High, Warwick held a Festival of Wellbeing, including dance, music, yoga, talks and workshops. At Knightsbridge School, each child was given the name of someone in their class to do something kind for during Children’s Mental Health Week. Bolton School invited writer and activist Natasha Devon MBE to talk to pupils about her own panic disorder and how to promote self-esteem. 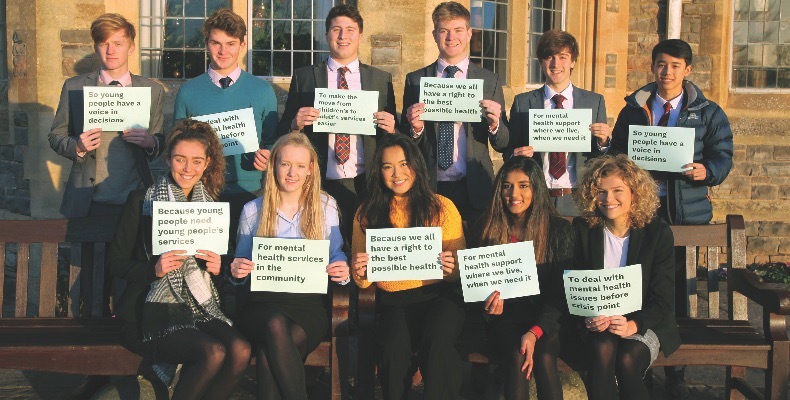 A Taunton School pupil raised awareness of the national campaign, Our Minds Our Future, by asking peers to hold up meaningful statements and have their photo taken, then posting on social media with the hashtag, #MyRightsMyMind. Mental health has become such an important issue that there are now events based around it. Supporting Student Wellbeing in Schools is a conference that ran for the first time last year, organised by Optimus Education. Over 120 delegates attended in 2018 and the organisers expect around 150 this year. It also runs a Mental Health and Wellbeing in Schools conference series in November for teachers, as well as a Wellbeing Award for Schools, which is a non-curricular award developed in partnership with The National Children’s Bureau. There are so many independent schools encouraging good mental health, more than can fit across these four pages. They are helping children to see through the ‘perfect’ images on social media and take up activities such as meditation or counselling to manage the pressures of the modern world. This means we’re talking about mental health more and more, and that’s what really matters.